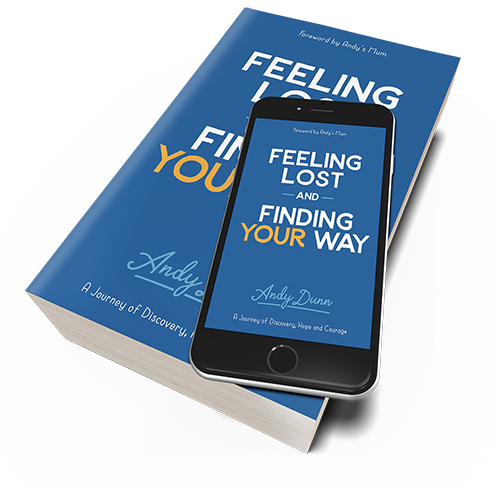 Feeling Lost and Finding Your Way is an inspirational memoir help people navigate uncertain times when graduating University or suffering with mental health challenges. With a Foreword by Andy’s Mum, the book is brave and uplifting. Aged 22, Andy's life collapsed into a dark depression. In Feeling Lost And Finding Your Way, Andy courageously shares his journey into postgraduate life, wrestling with the pressures of being successful, of being a young man in a hyper-sexualised digital world and being brave enough to search for what really mattered. He delves into past experiences, openly sharing his pain and the source of his suffering, before revealing the paths he took to find inner peace and his true direction. "I knew I wasn't alone feeling this. Finding the courage to share my story is one of the best decisions I've ever made. People write to me and tell me how they find both comfort and inspiration too. I hope it keeps reaching people's hearts and souls." “It doesn't pretend to be a self-help book. It is a story of the time in Andy's life where he had some problems, and that although they don't just disappear, they can go away with time, but you need to put the effort in to speed up the process, and knowing that someone went through the same thing others are going through, and came out the other end is a great help to anyone suffering. It does have the odd grammatical mistake here and there, but it's not pretending to be artwork, it reinforces the fact it is real. I can recommend it to anyone suffering from any mental health problem. 10/10, would read again.” –David.